To start off, I was aware that the embargo for this movie lifted at 7:00 PM Thursday night, which usually is a death sentence for a film. Come early Friday morning, I saw 24% on Rotten Tomatoes. I couldn’t believe that only 24% of critics found this movie enjoyable, a percentage point lower than the lauded Book of Henry that came out the very same weekend. My dad wanted to see the movie, so I said “Yeah, I want to see the movie for myself, and I think it’d be nice for the father’s day weekend to see a flick with my dad.” I can say that I walked out of the theater a bit pleasantly surprised, as I didn’t think it was a terrible film like most critics and some celebs are saying. 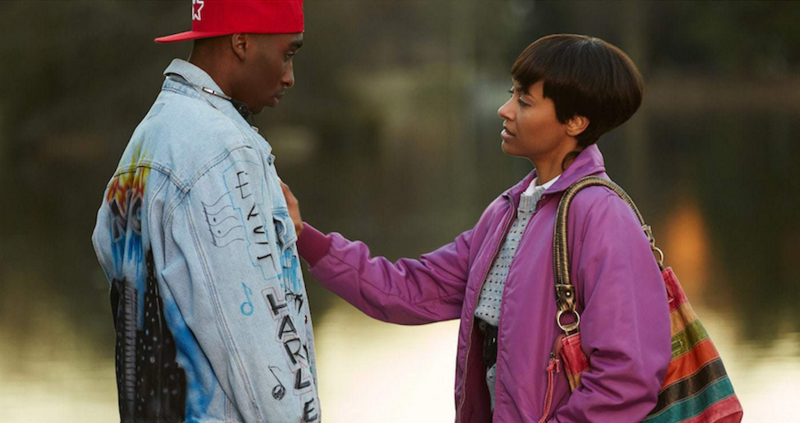 Starting off with the positives, I thought that the cast overall ranged from decent to pretty good, with Demetrius Shipp Jr. being the obvious stand out role, playing the legend Tupac Shakur. He looked the part most definitely, pulling off both the Juice-era and All Eyez on Me-era Pac. He did a fairly good job in capturing the drive and ambition that Shakur had, but some instances of Shipp trying to express Shakur’s passion came off as a bit over-acted, but these were few and far between thankfully. I also thought that Kat Graham did a good job in portraying Jada Pinkett, as her chemistry with Shipp was exceptional and she was able to match Pinkett’s mannerisms and voice to a tee. According to Jada Pinkett-Smith, this scene never occurred, as she says he never said goodbye to her, and he didn’t read that poem to her; she read it in his book: The Rose That Grew from Concrete. The rest of the cast was alright, with Danai Gurira as Afeni Shakur being really the only other actor/actress that caught my eye throughout the film. She was very believable as a member of the Black Panther Party, and she did a good job in carrying herself as a strong and supportive mother throughout a majority of the movie. A few appearances from some big names such as Dr. Dre and Snoop Dogg were welcome, as Snoop Dogg’s appearance got a big laugh and applause from the audience in the theater. The film did do a good job with its comedic moments, as most of the jokes and humorous interactions amongst the characters clicked and got big laughs and smiles from the audience. While the movie has fairly good acting bits throughout, the film suffers quite a bit from the direction. Director Benny Boom’s prior films were Next Day Air and S.W.A.T. : Firefight, and he’s had a history of directing music videos as well; I can kind of tell that Boom doesn’t quite have the right stuff yet when it comes to directing. The pacing is off throughout the movie, as it really does feel like you’re watching a 2 1/2 hour movie, and there are some noticeable tonal problems laced throughout, as in one scene we’re seeing somebody getting manhandled by police officers, and about three minutes later we see Tupac partying it up, living the lavish lifestyle or trying to charm his way towards a woman’s affection. I’m guessing they were trying to get at Tupac putting on this persona of “Mr. Hollywood” while there’s folks getting shot up and being mistreated in the streets with scenes like this, but they address this in other parts of the film that hit the point just fine, so these types of scenes make the movie a bit jarring at times. Another gripe that I have is that there were so many missed opportunities. There were big issues and conflicts that were a part of Shakur’s life, but we just get a bit of the inciting incident and we just move on to the next scene without looking at the fallout of these actions. We could have spent time looking at how these events (such as the shooting of the two undercover officers, and Shakur’s previous encounter with the cops after he was “caught jaywalking”) impacted both the black community and his music as a whole. I just think that delving into these issues a bit deeper would allow us to better understand Shakur a bit better and the effects of the circumstances around him a bit better as well. There were also instances of violence and confrontation that would just come out of nowhere as well, with fights breaking out that would lead to a bit of a dead halt in the story, which was supposed to display some of the horrors that came with the lifestyle, but the execution just wasn’t done well. The biggest complaint that I have with the film, however, is the ending; SPOILERS I GUESS, I MEAN WE ALL KNOW HE DIES, but the way they handled his death was so lame and flat. The better ending would be them showing us Afeni and Tupac sharing their final moments together in the hospital, and her ultimately pulling the plug, as they had built up their relationship a great deal in throughout the beginning and middle of the movie. This could have been such a powerful scene, with Tupac’s mother pouring her heart out over her dying son who was victim to the lifestyle she warned him about, while also coming to terms with the situation and ending the pain both she and her son were going through. Then to end on a lighter note, show a bit of a montage of the positive moments in Shakur’s life with text displaying his many accomplishments and some excerpts from his real-life interviews (which were done after the actual ending of the film). While there were quite a bit of problems on the directing side and creative decisions of the movie, I thought that the lead actors and actresses were able to move me along to ultimately care about and enjoy seeing these icons brought to life on the big screen. I hope that Shipp Jr. isn’t put in a “punishment by association” predicament with all of the bad press the movie’s getting, as I thought he did a very fine job in capturing the essence of one of the most influential and important figures in the hip-hop world. Overall, I’d say that this was fine; it kept me invested and entertained for the most part (especially with a pretty dang good soundtrack), but really faltered with the work behind the camera. I’d give this movie a 6.0/10. And the ONLY real standout acting performance stems from Danai Gurira who stars as Afeni Shakur. Her facial and verbal delivery is superb in comparison to the other pedestrian players. I’m not taking anything away from Demetrius Shipp who stars as Tupac, but he seemed to merely be going through the motions during half of his screen time. If it were not for him physically resembling Tupac to the core, I would not have been convinced of the passion, the power and intensity that evoked the spirit of Tupac. “All Eyez On Me” just is not a good film overall and I would much rather see a seasoned director take on such masterful work in another box office or 6-8 part, television series release. and lets not even talk about the monstrosity that is the ending. Would it have killed the creative team to show Afeni battling with the heavy decision to pull the plug on Tupac’s life support?…or even to show Tupac laying on his death bed and shaking the mattresses with both hands clamped down at his sides because he had something he wanted to GET OUT, but could not speak? THESE are the stories that have been told by close friends who visited him between September 6, 1996 and September 13, 1996. The film should NOT have ended with Tupac’s body laid out on the Vegas strip and a slew of title cards plastered across the screen highlighting his “Hollywood” achievements. The gospel music that played beneath the ending scene was very misplaced and drowned out the heavy emotion.